In order to send out emails from within Fileboard to your prospects using your own name and not as hello@fileboard.com, you can integrate your Gmail account with Fileboard. 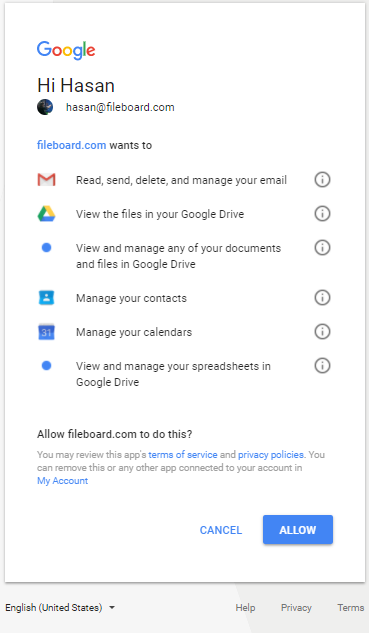 Follow the steps in this document to integrate your Gmail account with Fileboard. 1. Click on your login details and then my settings. 2. Click on integrations and then Gmail tab and click on Connect Gmail. 3. Enter the information for the desired Gmail account you would like to use. If already signed into Gmail, it may simply ask you the next step. 4. Now click on the blue Allow button. Your Gmail account has been linked and your emails will be sent out using your Gmail address. You can click on the "Disconnect" button to disconnect your Gmail account whenever you want.